At this time of year, I struggle with my hands. My skin objects strenuously to being cold and damp, I’m not good at winter on so many different levels. And I don’t get along with many skin ointments, lotions or potions, either they’re too scented, or they just kind of grease your skin without actually protecting it. 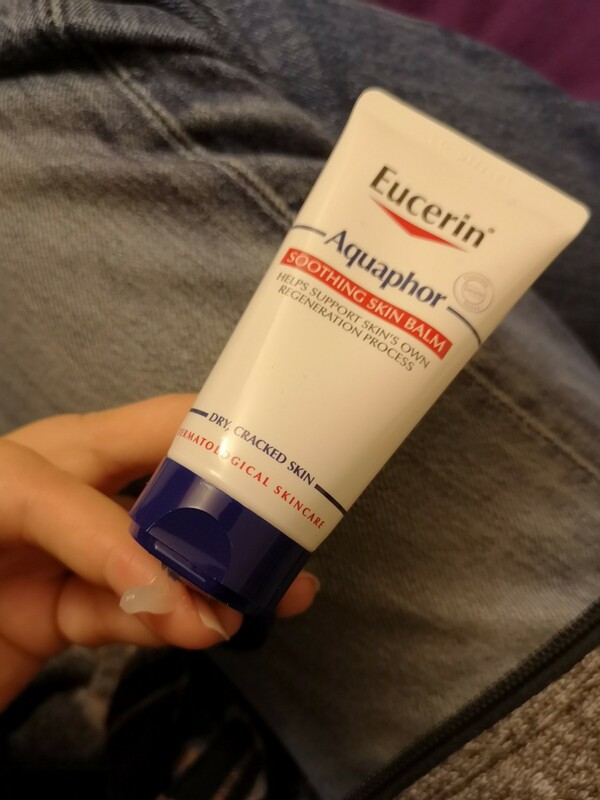 I was interested to give Eucerin Aquaphor soothing skin balm a go and I’ve got to say I’m pleasantly surprised. For starters, I hope you can see how thick the balm is there. But despite that it goes on so easily and just rubs in without any fragrance at all and although my skin looked a little shiny, there isn’t any residual greasiness. This may of course be something to do with his dry my hands are! You really don’t need very much at all, and you can feel it making a difference straight away. I was so taken with it it now lives in the bag of everything that gets carted around with me everywhere, and when I forgot lip balm it stood in for that. It’s good. So good that even eldest daughter, who has sensitive skin, gave it a whirl and a mood of approval. I’m definitely going to be recommending this, and picking up a couple more tubes for the car and the camping kit. Camping is the other activity that tends to end up with me wearing my hands out. Have you come across Eucerin Aquaphor before? Got any thoughts on it?